Shame on me, I missed one of my friends Birthdays recently so this is the card I have made to say sorry. She is on holiday at the moment so she will get it on her return. When this set came out I fell in love with it and loved all the samples by the ATS DT and this card is inspired by those. I layered SU! Bashful Blue CS on to a white card blank then a layer of white CS followed by a strip of Piggy Tales paper accross the bottom wrapped around with some blue grosgrain ribbon. I have then stamped the cute snail with Airondack ink and hand drawn a little trail for him, coloured in with Copics. On a seperate piece of card I stamped the balloons and cut them out adding glitter to them with my Spica pen. I have then stamped the greeting seperate too and rounded the corners to make a tab. The obligatory 3 gem stones added to finish! STAMPS: CC Designs. INK: Airondack Pitch Black. CS: Craft Creations, Stampin Up!, Papertrey Ink, patterned paper by Piggy Tales. ACCESSORIES: Woodware small corner rounder punch, Grosgrain ribbon by Ribbon Oasis, Papermania Adhesive Gems, Copic At You Spica glitter pen, Copic markers. Ahhh this is sooo lovely Michelle! I'm sure your friend won't mind when she sees this card, its FAB!!! Hi Michelle! Luv all your latest cards,I have my eye on the snail set,too,lol!!! So cute! 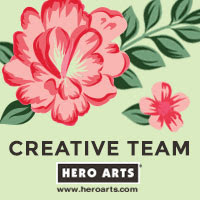 Love the snail image! 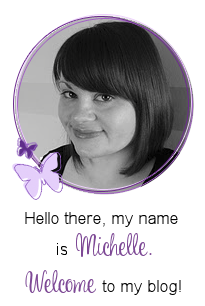 Very cute Michelle, I love the colours and the cute little snail. lovely card Michelle, paper looks fab as does that cute wee snail. 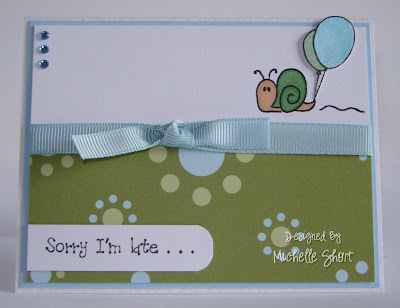 Hi Michelle, this is a such a great card, perfect for being late with the snail! Just thought I would let you know that I have tagged you if you get chance in between crafting and everything else! What a cute card, looks perfect.